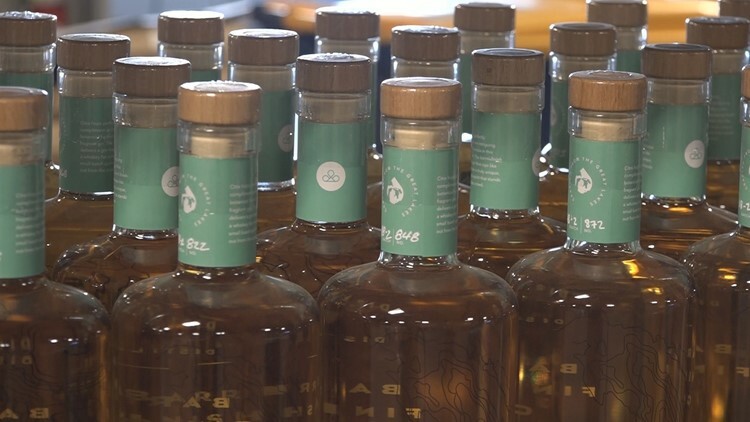 13 ON YOUR SIDE talked to the co-founder of Gray Skies Distillery in Grand Rapids to find out how the company is moving forward after a massive excise tax cut. GRAND RAPIDS, Mich. -- It's been more than five full months since President Trump signed into law the Tax Cuts and Jobs Act of 2017, one of the most notable achievements of the Republican Party during Trump's time in office so far. We're learning more about how the law affects every day Americans as time goes on. Just like with any piece of legislation, there are winners and losers. In this case, the list of winners includes small craft distilleries like Gray Skies Distillery in the Monroe North neighborhood of Grand Rapids. Gray Skies has been in business for around two and a half years and has recently been able to expand production because of one specific aspect of the GOP tax law. It's called the Craft Beverage Modernization and Tax Reform Act, which was an amendment to the big picture bill Trump signed into law in December. There's a lot to the law, but here's why it matters to Gray Skies and other distilleries like it: excise taxes are much, much lower for them now. 80% lower to be exact. "The instant a drop of alcohol is produced, tax is owed on that," said Steve Vander Pol, who co-founded Gray Skies and serves as the head distiller. The law reduces excise taxes on producers from $13.50 per proof gallon for the first 100,000 gallons produced to $2.70 per proof gallon. "We're talking thousands of dollars every quarter that we're saving," Vander Pol said, "and obviously for someone on this sized scale to write a check that's reduced by 80% is pivotal. It's been huge for us." Bottles of spirits from Gray Skies Distillery in Grand Rapids. What the distilleries do with the savings is up to them. Some across the country have added jobs. Others, like Gray Skies, have expanded production. "It shakes out to about five barrels a quarter, so 20 barrels in a year," Vander Pol said. "It doesn't sound like a lot, but when you're producing maybe 100 barrels of bourbon, to get an extra 20 barrels that you can put into your production is huge." Distilling, though, is a process. So it'll be awhile before those extra barrels can be sold and enjoyed. "We age our rye and bourbon whiskey for a minimum of two years," Vander Pol said. "It takes years to make a world class whiskey and that's what Gray Skies is all about, so the change in the tax law allows us to build up a bigger inventory and when those are available, hopefully, we'll be able to meet demand for them."